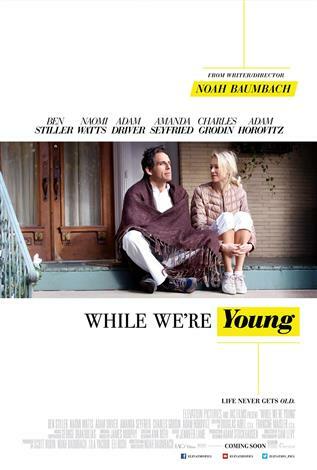 Noah Baumbach, who made an impressive directorial debut with “The Squid and the Whale” over a decade ago, continues to tell unusual stories with an enjoyable little film called “While We’re Young”. The overall result may not be as good as Baumbach’s previous movies, but it still works quite well. Ben Stiller gives a finely tuned performance as a documentary filmmaker who’s been working on his latest project for a decade. He’s married to Naomi Watts and they’ve both given up on having babies after several failed attempts. It is very clear from the first moment that they’re going through a mid-life crisis. Enter Jamie (Adam Driver), an outgoing young man, and his wife (Amanda Seyfried) who seem to represent everything they’re not. Both couple instantly hit it off and soon enough Stiller and Watts find themselves trying to recapture their youth. If you’re expecting a typical Ben Still comedy, you’re watching the wrong movie. If you like multilayered character portraits, and don’t mind a laid-back film every once in a while, you may enjoy “While We’re Young”. I can’t place it on the same level as “Greenberg” (also starring Ben Stiller) or “The Squid and the Whale”, but I also can’t dismiss it as a mere exercise. All I can say is that it entertained me. If you admire the actors as much as I do, and appreciate writer director Noah Baumbach’s mindset, I think you will feel the same way. I’m interested in this one, particularly to see the dynamics between four actors I would have never put on-screen together.